Padre Melo is the recipient for Annunciation House's 2018 Voice of the Voiceless Award. Tickets are $50 per person. WHEN: May 12th 6 p.m.
​WHEN: May 14th 6:00-9:00 p.m. WHEN: May 15th 7:00 - 9:00 p.m.
​Boston Honduran rights events open to public. Open to all who attend church that day. Weather permitting, reception may be held outdoors; call (617) 266-7480 for final locale. Delegates living in the Chicago area. WHEN: April 19th 12:00 - 1:30 p.m. WHEN: May 14th 6:00-7:30 p.m.
or (312) 641-5151, X116 to RSVP to the event(s). WHEN: May 14th 12:00 p.m. 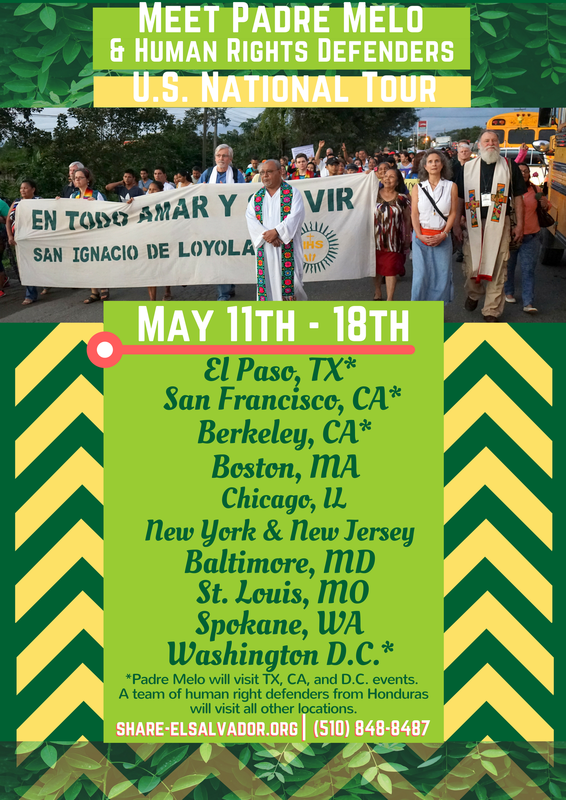 WHEN: May 14th 5:00 p.m.
Semi-private gathering, presentation and potluck with bi-lingual Latin American activists, indigenous, lawyers, and faith leaders. WHEN: May 17th 5-7 p.m.
WHERE: 1460 Columbia Road, NW Suite C-1, Washington, DC. WHEN: May 18th 10-11 a.m. WHEN: May 18th 12:30-1:45 p.m.
MORE INFO: Panelists: S. Rosa, Karla, Dunia, Adelso and Ely. Ismael “Melo” Moreno is an Afro-descendant Jesuit priest in northern Honduras. He is known as Father Melo, reflecting his warm and charismatic personality. For the last 20 years he has been the leader of two social action projects of the Society of Jesus in Honduras: Radio Progreso, and ERIC, who provide accurate real-time reporting and human rights observers/mediators. Radio Progreso is broadcast from El Progreso, with transmission in San Pedro Sula and also Tegucigalpa, somewhat similar to the Pacifica radio stations in the U.S. 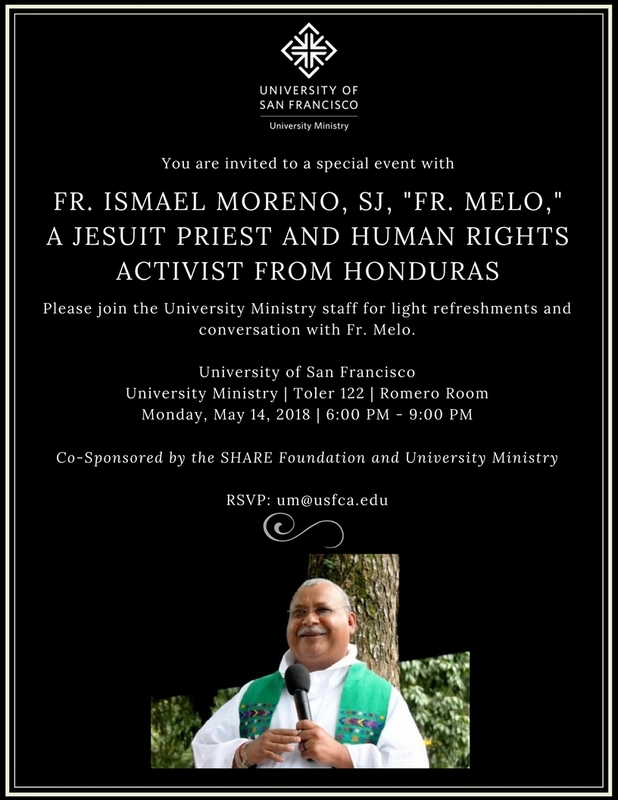 In 2015 Father Melo received the Rafto Prize, created in honor of a Norwegian human rights activist and in 2016 he was asked by students at the National University of Honduras (UNAH) to negotiate on their behalf for grievances against the administration. Father Melo worked closely with Berta Caceres, the environmental heroine who was assassinated in 2016. Father Melo and his colleagues have received numerous death threats and he is number two on a recently published assassination list of 13 social justice leaders. Karla Rivas is a journalist with a degree from the Universidad Nacional Autónoma of Honduras. She coordinated the news department of Radio Progreso from 2002 to 2012. She has facilitated training processes in radio and analysis of context. In 2011 she received the Peter Mackler Award for Radio Progreso from the Global Media Forum and Reporters without Borders for ethical and courageous journalism. As part of the area of Investigation and Human Rights of the Reflection, Investigation and Communication Team (ERIC) - Radio Progreso, she coordinates the Jesuit Network, Migrant in Honduras. Dunia Aracely Pérez, feminist, human rights defender and attorney with the Reflection, Investigation and Communication Team (ERIC) and Radio Progreso, both Jesuit missions in Honduras. In the area of Investigation and Human Rights, she accompanies and defends victims within the Inter American Human Rights System. Sister Rosa Maria Trochez is a woman religious member of the Congregation of the School Sisters of Notre Dame, who works as a defender of the human rights of women. In 1975, serving in the Catholic parish of Juticalpa, Rosa Maria witnessed one of the worst massacres in the history of Honduras. The Honduran military, trained by US armed forces, came to her parish and kidnapped, tortured and killed Fathers Ivan Betancourt and Michael Jerome Zypher, the latter from Wisconsin. Rosa Maria was taken to prison. While jailed, she learned that 14 peasants, many of them religious leaders in their communities, had been killed as part of an effort to destroy the rural movement that fought for Agrarian Reform. Rosa Maria decided to join the School Sisters of Notre Dame and commit her life to justice. She studied Liberation Theology with Father Gustavo Gutiérrez. During the 1980’s, Rosa Maria accompanied thousands of refugees as a pastoral agent in Mesa Grande, Honduras. Following this intense period, Rosa Maria studied alternative medicine in Guatemala for four years. As a School Sister of Notre Dame in El Progreso, Yoro, Sr. Rosa Maria works to uphold the rights of women and impoverished communities, in collaboration with other religious congregations and social movements. Ely Castro Rosales began his human rights activism while still a teenager in the 1980s, when he joined the Movement of High School Students in defending human rights, especially the rights of students. He continued his activism through his university years and into his professional life, when he worked as Regional Director with the company Grupo Santillana for 16 years. During the bloody coup of 2009, Castro Rosales was involved with the National Front for Popular Resistance. In the struggles for constitutional integrity leading up to the 2017 elections, he became the coordinator for the Convergence Against Continuation. Ángel Adelso Reyes is the parish coordinator, president of the health committee of San Nicolás, Santa Bárbara, member of serveral patronatos, secretary and president of the committee for ecclesiastical works of the catholic church San Nicolás; Coordinador of the Multi-Sector Network of vulnerable groups in San Nicolás, Santa Bárbara; part of a group of Friends of Radio Progreso - ECOS -that supports the promotion of the radio in the zone of the valleys through the club of Friends that makes an annual contribution in support of the radio. Sponsored by SHARE in collaboration with: Sisters of Mercy of the Americas, American Friends Service Committee, Central American Resource Center (CARECEN), Church World Service, Columban Center for Advocacy and Outreach, Eighth Day Church, Franciscan Action Network, Jesuit Conference Office of Justice and Ecology Leadership Conference of Women Religious, Maryknoll Office for Global Concerns, National Advocacy Center of the Sisters of the Good Shepherd, Sisters of St. Francis of Philadelphia, plus a host of local faith group collaborators in each of the cities.